While Tumblr might have yielded the way to Pinterest as a game of pictures, I suspect there are still devoted Tumbloggers out there, to whom I would like to introduce my favorite blogs. Simply my favorite street style blog of all times, partly for being located in the same city where I grew up, but mostly because these creative and open-minded guys totally deserve all the love and recognition. Proceed with caution if you are a fan of Irina Nikolaeva, Nastya Kusakina, Sasha Luss or basically any other Russian runway model, because the blog of Moscow’s best model agency is supercharged with beauty and you might very easily lose sense of time. It is not really a fashion blog (sorry I tricked you here) but hey! it is about everything that’s going on in Moscow and written in great English, probably by some expats (they just have to be! A Russian will never confuse its and it’s). Moscow Is My Oyster is more of a traditional blog with lots of text. Very entertaining and highly recommended! Another great street style blog, brought to you by the Aurora Fashion Week team. This blog contains impressive 2000+ (two thousand) pages filled with reviews of collections from almost every existing fashion week. Excellent for research or… motivation. Yes, there is text and it is in Russian, but you didn’t go there to read, right? You don’t really care about a top model’s everyday life, what she eats and whom she meets… Ok, I’m not telling you any more. Just use Google Translate and find out by yourself. Beauty has no names, nor it needs any description. Visit the blog of the Ukrainian photographer and model and be prepared to fall in love. 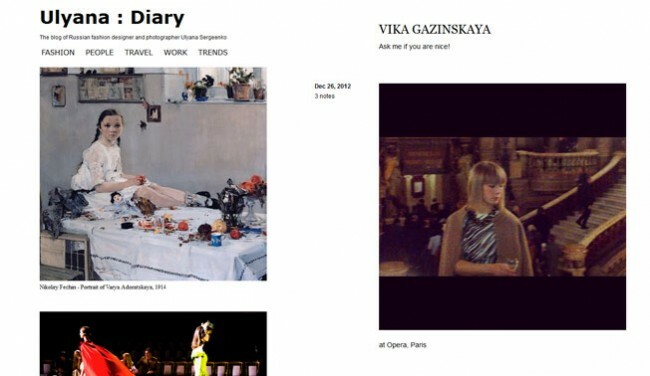 Of course, Ulyana Sergeenko and Vika Gazinskaya are on Tumblr as well. You can probably guess why I made you wait till the end to let you know that :) Ask them if you are nice! (it is a quote).